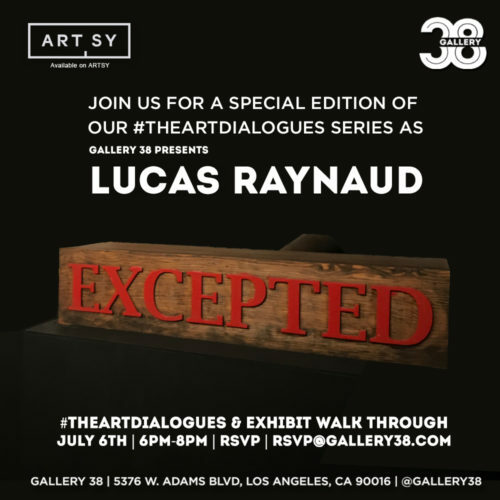 Gallery 38 is pleased to invite you to #THEARTDIALOGUES for the “EXCEPTED” solo exhibit, a series of new work by Lucas Raynaud. In using the word EXCEPTED, sometimes often confused with the term “Acceptance”, Lucas intends to demonstrate exclusion in society through the miscommunication. The exhibit will feature all new works by Lucas Raynaud, mixed media pieces as well as interactive installations that will highlight the use of religion, politics and changing narratives to aide and also strip human beings of rights. The artist’s attempt is not to attack people with different views, but rather challenge the audience while holding a magnifying glass into themselves through the presentation of the work. The exhibit uses flags over light boxes, large screen prints and woodwork installations to pose different questions. Terms such as “All Lives Matter” are used to counter activists and silence their fight, Lucas challenges the term to see if the people that use those statements really believe it. View the exhibit on Artsy and in our online gallery.